Spend an evening with Damian Wilson & Adam Wakeman at Kirton Lindsey this Saturday, February 3. The duo will be playing songs from their individual back catalogues and artists they have worked with, along with tracks from their duo album ‘Weir Keepers Tales’ and Damian’s latest solo album ‘Built for Fighting’, intertwined with stories and memories from their touring careers. 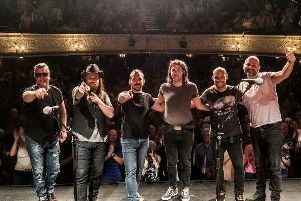 Damian Wilson is widely known for his contribution to the progressive rock genre, as lead singer with bands such as Threshold, Headspace and Landmarq. He has appeared on 70 separate album releases and has released five solo albums. He is a well-respected guest vocalist, working with Rick Wakeman’s English Rock Ensemble, Mostly Autumn, Praying Mantis, as well as many others. He has also played the lead role of Jean Valjean in Les Miserables on their UK National Tour. Damian has one of the most versatile voices in rock, with an incredible range. Adam Wakeman is most well known as the keyboard player with Black Sabbath. He has released nine albums with his father Rick. Much of his early touring was with Rick, playing all over the world, either with the two of them sitting at grand pianos or in full scale rock performances with Orchestra and choirs. A highly sought after keyboard player and musical director, his career has seen him tour, write and record with some of the biggest selling artists in the recording industry. Advance tickets cost £13.50 from One Stop (Kirton), Brian on 01652 649230, or at www.wegottickets.com.